My Marine and Me: Brrr! It got cold! How did that happen?? Yes we were all waiting for fall but this feels almost wintery! Geeze. Yesterday Ryan and I were going to go on our traditional nightly walk (since there is finally no rain!) and we made it as far as the curb before saying, nope, too cold having a cigarette and going back inside! Ryan made yummy chicken fajitas for dinner and we opted to snuggle onto the couch and watch movies. After the end of You've Got Mail we start browsing the channels. I see Halloweentown is on the Disney Channel. Before I can stop myself I blurt out, "Oh my god! Halloweentown??? I love Halloweentown!" 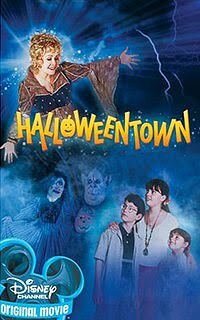 Then I realize my big bad Marine husband probably would rather gouge his eyes out than watch a kid's movie on the Disney Channel but to my surprise he says, "Halloweentown! Oh wow I remember that movie! Let's watch it!" OH! If any of you want a free Blue Star flag for your home/apartment/whatever click here! Allow 4-6 weeks for delivery. I LOVED that movie! Jacob probably wouldn't have been as awesome as Ryan though, so jealous! How funny! i totally ordered myself a blue star flag right after hubbs deployed.